What is the working principle of intelligent colored lights controller? The colored lights controller can control the five-circuit lanterns to be lit up by line by line, and then decremented by line by line. If you connect a certain number of colored lights, you can create a scene with a change in color on the plane, which is more colorful than the color flow that normally controls a line. The circuit works as follows. 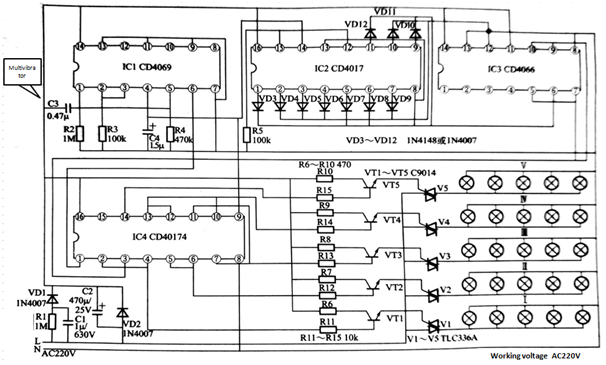 The intelligent lantern controller circuit is shown in Figure 1. It mainly consists of the non-gate IC1 (CD4069), the counting/timing distribution circuit IC2 (CD4017), the analog electronic switch IC3 (CD4066) and the D flip-flop IC4 (CD40174). In CD4069,the non-gate F1, F2 and external resistors R2, R3, capacitor C4 constitute a multivibrator, generate a pulse square wave of about 3Hz, supply CD4017 as a count pulse and CD40174 as a shift pulse. Resistor R3 and capacitor C4 are oscillating frequency setting components. Changing the parameters of component resistance R3 and capacitor C4 can change the frequency of the oscillating signal, thereby controlling the speed of color change of the lantern to present various visual effects. In addition, the NOT gate F3 in CD4069 also acts as an inverter for the CD40174 reset signal. CD4069 is a high input impedance device that is susceptible to external disturbances causing logic clutter or inductive static that breaks through the gate of the FET. Although the internal input of the device is provided with a protection circuit, they absorb limited transient energy. Excessive transient signals and excessive electrostatic voltage will disable the protection circuit. Therefore, the non-gates F4 and F5 that are not used in the CD4069. The input terminals 9, 11, and 13 pins of F6 are connect to GND for protection. The pulse string sent from the 1440 pin of the CD4069 multivibrator output is directly sent to the counting pulse input terminal 14 pin of the CD4017. The CD4017 is a decimal counter/timing splitter that is used to generate control signals for the CD4066 analog switch. Cr is the reset terminal. When the Cr terminal is input high, the counter is set to zero. The CD4017 has an auto-start function, that is, when the circuit enters the inactive state, it can return to the normal cycle after a maximum of two clock cycles under the action of the counting pulse. Therefore, the CD4017 of the controller does not have a power-on reset circuit. Co is the carry output and outputs a positive pulse when the count is 10 clock pulses. CD4017 has counting inputs of CL and EN, and the CL terminal is the rising edge of the pulse. If the counting pulse is input from the CL terminal, the EN terminal should be connected to the low level; the EN terminal is the pulse falling edge trigger terminal, if the counting pulse is from When the EN terminal is input, the CL terminal should be connected to the high level, otherwise the input counting pulse is prohibited. The counting pulse taken from CD4069 is input from its CL terminal 14 pin, so the EN terminal 13 pin is grounded. Y0~Y9 are the ten output terminals of the counter. The pulse square wave sent from the output terminal is connected into two control signals through the isolation diode (IN4148) VD3 ~ VD12, and is added to the analog switch CD4066. When the first counting pulse arrives, the circuit in CD4017 flips, 3 pin Y0 is high, and is applied to 12 pin of CD4066 via diode VD5. CD4066 is a bidirectional analog switch. It contains four independent analog switches A, B, C and D. The controlleruses two switches, B and D.
Since the two switches are connected in series, the output terminal 10 pin of the B switch is connected to the input terminal 9 pin of the D switch as a switching point of high and low levels. In addition, the 12 pin and 6 pin of CD4066 are the strobe terminals of switches B and D respectively. When the input is high level, the switch is closed: when the input is low level, the switch is turned off. Switch B turns on 11 pin and 10 pin at the high level of its strobe terminal 12 pin input, and 10 pin becomes high level. At the same time, the remaining output terminals YI ~ Y9 of CD4017 are low level, so the strobe terminal of CD4066 switch D is also low level, switch D is turned off, so that the level state of 10 pin is not affected. The high level signal of the 10 pin output of the CD4066 is directly sent to the serial input 3 pin of the D flip-flop CD40174. The CD40174 contains six D-type flip-flops. The controller connects five of them into a five-bit shift register for serial input and parallel output. Among them, D6 is the highest-order flip-flop, and D2 is the lowest-order flip-flop (D1 is not used), which are arranged in order. The output Q of the upper one-bit flip-flop is connected to the input D of the low-position flip-flop. Only the 3-pin receive pulse signal of the input terminal CD40174 of the highest-order flip-flop D6 is received. The CD4174's 2,4 pin, 5,6 pin, 7,11 pin, 10,13 pin, 12, 14 pin are the connection points of the input and output terminals of each adjacent flip-flop, respectively, as the parallel output of the five-bit register. The reset terminals of each flip-flop are connected together as the total clear zero terminal of the register. The low level reset is valid before the register is operated, and the work start reset signal should jump to high level and remain in the working period. The reset signal is provided by a reset circuit composed of a capacitor C3, a resistor R4, and a CD4069 non-gate F3. At the moment of power-on, the power supply voltage is divided into a positive pulse by C3 and R4. This pulse is inverted by the non-gate F3, output from the 6 pin of the CD4069, and sent to the 1 pin of the CD40174 reset terminal to complete the zero mission before the register operation.As time goes on, C3 charges up and forms a stable low level at its negative terminal, which is inverted by F3 and then meets the needs of register operation. The clock input of each flip-flop is also connected together as the shift pulse input of the register. For more product information, please go to the website to get it.